This extremely variable mushroom is best recognized by its stem base, which develops pinkish to orangish colors, inside and out. The cap color ranges from whitish to grayish, blackish, yellowish, or greenish (or even brownish or copper colored), and the taste and odor are odd, reminiscent of soap. Tricholoma saponaceum is primarily a conifer-loving mushroom, but it is also found under hardwoods. Several varieties of Tricholoma saponaceum have been separated on the basis of color variations, and the grayish version is sometimes called Tricholoma saponaceum var. ardosiacum, while the "true" Tricholoma saponaceum (var. saponaceum) demonstrates greenish and yellowish colors. 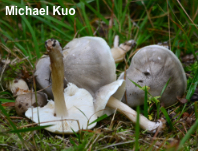 However, Tricholoma expert Kristen Shanks (1994, p. 157) suggests that the cap color "may vary with age as well as between populations." Ecology: Mycorrhizal with conifers or hardwoods; growing alone, gregariously, or in clusters; summer and fall (or in winter and spring in warmer areas); widely distributed in North America. Cap: 3-9 cm; convex, becoming broadly convex or flat, often with a central knob; dry; grayish green, yellowish green, gray, blackish, copper colored, or brownish; fairly smooth, or occasionally with minute, appressed fibers. 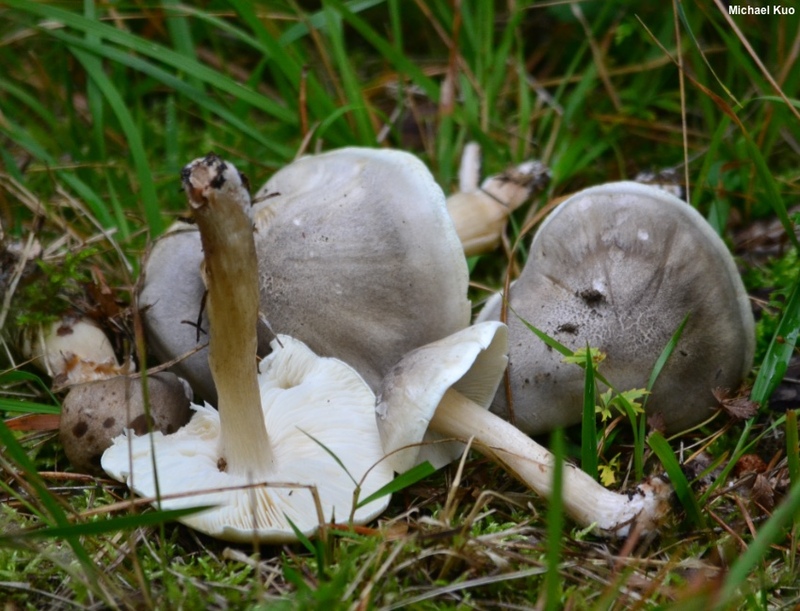 Gills: Attached to the stem; close; whitish to pale greenish or pale yellowish; sometimes discoloring pinkish. Stem: 4-11 cm long; up to 2.5 cm thick; equal or, frequently, somewhat swollen in the middle; usually tapering to the base and rooting somewhat; smooth or with silky appressed fibers; sometimes with tiny grayish scales; dry; white or pale greenish overall, the base pinkish to orangish. Flesh: Whitish, except in the stem base, where it is pinkish to orangish. Odor and Taste: Taste not distinctive, soapy, or slightly mealy; odor similar. Microscopic Features: Spores 5-7.5 x 3-5 µ; smooth; elliptical; inamyloid. Cystidia absent. Clamp connections present. REFERENCES: (Fries, 1818) Kummer, 1871. (Saccardo, 1887; Kauffman, 1918; Smith, Smith & Weber, 1979; Ovrebo, 1980; Arora, 1986; States, 1990; Phillips, 1991/2005; Lincoff, 1992; Shanks, 1994; Evenson, 1997; Roody, 2003.) Herb. Kuo 01150503, 08060503, 11020502, 09010606.